I’m lucky to live in one of the leafier parts of Leeds, and there is a reasonable amount of green space within an hour’s walk from my home. Yesterday I made my first visit to one such area: Clayton Woods, which turned out to be much more interesting than I was expecting. The woods themselves are pleasant enough to walk through – small dirt tracks weaving through trees and speckled with boulders. There is enough tree cover that the sound from the nearby road is almost blotted out. However, what was most fascinating was what lies at the centre: an abandoned quarry. I had heard about this quarry, but there doesn’t seem to be much information on it aside from a small number of mentions on web forums about the Leeds area. I thought it was worth trying to pull some of that information together here in one place. The site was designed to extract sandstone formed from the Carboniferous millstone grit that covers much of the area (some details here) and the two ponds near the south-east edge are (I think) the original excavations for the quarry. They have been fishing ponds for quite a few years and are very deep (16-18 feet, apparently). I cannot find a date for the start of the quarrying but the image above shows an A.R.Briggs truck in the 1930s (courtesy of Leodis, copyright Leeds Library & Information Services), and the site was certainly active through the 1950s (an anecdotal account of blasting) and 1960s (a catalogue of stone suppliers). The site was actively quarried through to sometime in the late 1970s or early 1980s and then abandoned, but I cannot find a reason why. At that point, according to a local resident (“jonleeds”, from whom I have obtained a lot of this info! ), the whole site gradually became overgrown and “a real urban oasis for all kinds of plant and animal wildlife”. At some stage around 2004-5, the Burford Group (perhaps this Burford Group, which is an international investment fund specialising in legal issues) purchased the site along with a portion of the ancient woodland surrounding it. In November 2005, Burford began a consultation with residents over a proposed £100m development of the site to include residential and commercial uses (details here from 2005, here and here from 2007, and here form 2011) as well as a new rail station. Apparently Burford embarked on an extensive campaign of scrub clearance which stripped the site back to bare rock in most places (this is the current state over most of the area) in preparation to begin a development that would involve a large number of houses, flats, a hotel, pub, and many shops. Burford has offered to donate the ancient woodland portion of the site to Leeds Council should the development go ahead. A desk-based archaeological survey performed by Burford showed that there were a number of known (and potentially some unknown) impacts on the archaeology of the area. However, it seems that nothing has progressed since around 2007 when local councillors objected to Burford’s plans on the basis that the site would make an excellent park-and-ride site, that the land was earmarked by the Council for offices, not residential space, and that it would cause major traffic issues in an already busy area. A number of proposed developments received little support from government (see links above), and no doubt the economic downturn has harmed Burford’s ability to develop the site. In 2010 outline permission was granted on the site, although a note states that “Constraints too costly to deal with. Outline consent for a housing-led mixed use “urban village” granted March 2010. Not suitable for B2-B8 next to residential.” So it looks as though the application has been provisionally accepted. The B2-B8 refers to certain industrial land uses. Surprisingly, I have been unable to find a copy of any environmental impact assessments for the area. If anybody knows the reference for the planning application then I should be able to access those from the Leeds City Council website, but I can’t find them anywhere… Regardless, there are mentions of a number of interesting plants and animals at the site. Great crested and common newts (Triturus cristatus and Lissotriton vulgaris, respectively) have both been seen at the site by a local enthusiast (jonleeds, who posted his sighting on the Secret Leeds forum). It seems that this was confirmed and that Burford constructed three mitigation ponds for the newts on the opposite side of the railway line (see photos to the right, copyright of Google as usual). As jonleeds later notes, the collapse of the Burford development now means that the original site was not lost so the newts have done pretty well out of the situation! I have already mentioned that the ponds in Clayton Woods close to the quarry have been fished for a long time for carp, and it seems that a Botanical Society of the British Isles field trip found a few interesting species (Geranium dalmaticum, possibly new to Britain in a wild situation. Corylus maxima, in both green and purple forms, and the moorland crowfoot, Ranunculus omiophyllus, which apparently was a surprise considering the low altitude. I have not been able to find any data on other groups. Looks like an interesting site. Invertebrate fauna, including spiders, could well be very interesting in a local context. If you look down into the ponds you can see that these are not just early excavations of the nearby quarry. These ponds are constructed with stone walls, using similar building techniques to those used in the construction of Kirkstall Abbey. I would guess that these ponds were built to supply the Abbey with fish. The stone used for the Abbey’s construction was quarried from Hawksworth woods nearby. The ponds were fish keeping facilities for the monks I believe. It was myself who first highlighted the GC newts to one Mandy Spry of LCC many years ago. I then got little response so contacted English Nature and got them to come and do a site survey etc. There used to be two ponds in the quarry next to the railway, one was a run-off coloured pond, but the other was crystal clear and full of weed and all manner of invertebrates. It was brimming with GC newts, the amount I have never seen before nor since. However, both ponds were tragically bulldozed. 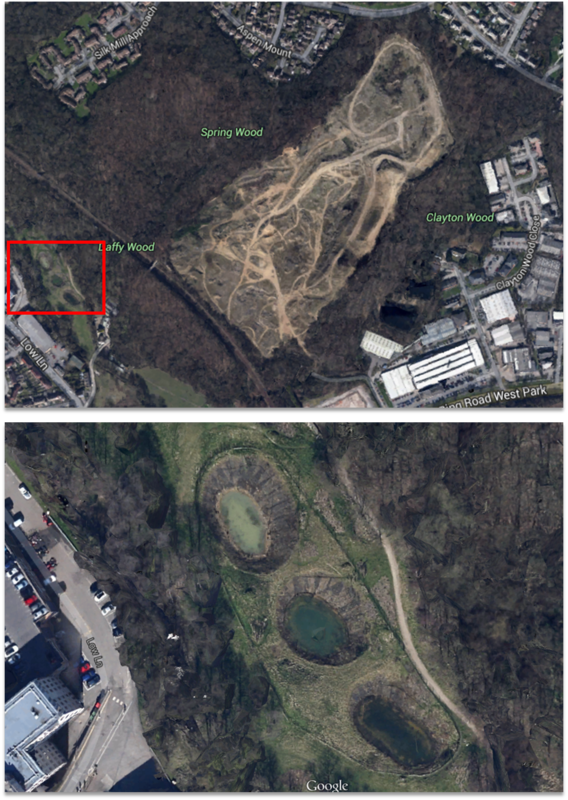 When I first highlighted the problem of the quarry i think ponds should have been made straight away, in the quarry themselves. this would have helped the GC newts breed and keep their number up. However, this didn’t happen and sadly now there’s hardly any left. The new ‘newt’ ponds at horsforth, are not really suitable for newts. Alot of alder growth is not cutting out sunshine and there will be a lack of marginal plants, this is, of course, where the GC newt needs to lay their eggs. IMO the ponds are too shallow and too near the beck. I agree they are better than nothing, but, and its a big but, is there any GC newts using them?????? I expect that the ponds on the quarry site fill naturally with rain and runoff. The ponds are deep so they don’t dry out and there’s a lot of tree cover to keep them shaded. The mitigation ponds are probably similar – GCNs like new habitats so letting them fill and colonise naturally would be best. From what I can gather the pools in the centre of the quarry which were the ideal habitat for several species of newts are largely spring fed from a number of freshwater springs that issue from the bottom of the quarry. This water is added to with seasonal rainfall and the levels of the pools can depend also on the amount of annual rainfall. In asddition to what Simon says above regarding contactiing Leeds CIty Council re: Great Crested Newts. I also raised the issue of the newts at a Burford Group public consultation meeting to which their representative was extremely non-plussed at my suggestion of their threatening protected species habitat and they claimed they had already done a survey. However after contacting English Nature myself and meeting their team back in 2007 for a true field survey the prescence of Great Crested Newts was confirmed and hence the Burford Group were obliged to take steps to protect the habitat or provide adequate alternative habitat. As to whether their well-meaning newt receptor ponds have been successful I find it hard to say. The receptor ponds on inspection 2 years after their construction appear to be far too deep and steep sided with little pond plants that would provide cover or egg laying surfaces. The following year the ponds were absolutely boiling over with thousands of frogs and toads – but little in the way of newts… On a happier note a couple of good years when adeqate rain and water from the springs has replenished the original pools I observed there to be a ratio of approximately 6 newts to every square foot of pond space! Anyway no furthur plans for development seem to be forthcoming and given the large amount of nearby housing development thats already taken place in the local area I believe it will be unlikely that any more planning applications for the qiuarry wll be granted any time soon. The ponds in the quarry are all linked by freshwater springs. I have been watching it’s demise for many years. There are still large amounts of smooth and palmate newts, but the GC are now nearly gome. This is a crying shame as it was once a true oasis for ampihibians, the numbers of which I have never seen before or since. Two weeks ago someone from Burford, was spraying plants in the quarry with what I presume was a herbicide. I am astounded by this. Please don’t get confused between Clayton fishing ponds and the quarry ponds. The clayton fishing ponds are ancient, the ponds in the quarry were ever-changing throughout the 1980’s as the quarry was being worked. I would love to see the springs being utilised into making temporary ponds and also that there was a clampdown on motocross bikes in there. Sadly, it seems, newts are not often high on the list of priotities. Hi, is the quarry site open to the public to walk around all year around? Thank you.